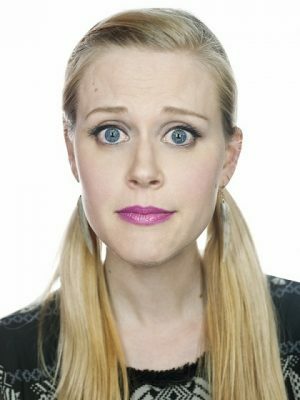 I’ve always liked Janet Varney, who I knew almost exclusively from her work with Thrilling Adventure Hour, but once someone made the connection for me (last year or the year before, I think) that she was one of the co-founders of SF Sketchfest, my admiration for her ratcheted up quite a few notches. So she’s super funny and likeable and charming and kind of a badass producer too? So cool! 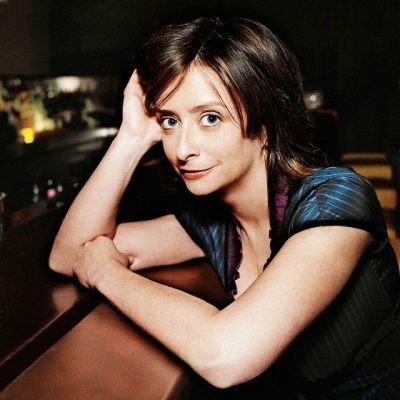 So this year when I was perusing the schedule, I saw that she was doing a live podcast (The JV Club, it’s called) with Matt Nathanson, Rachel Dratch, and Jon Hamm? Hell yeah! I’d been trying to get to a Rachel Dratch appearance at Sketchfest for at least a year or two, and Jon Hamm is so fun when he’s in comedy mode (which I’d not yet seen live, either). I immediately put in my request and hoped I’d get to cover the show. And the next thing I knew, there I was, at Brava Theater Center, last Saturday afternoon with a great seat, just in time for the house lights to go down. At the top of the show, Matt Nathanson and Janet Varney took the stage alone. I admit, I had forgotten that Nathanson was scheduled to be there as well, so I was happy. (Seeing Nathanson at a Sketchfest event I’m covering for Spinning Platters takes me full circle: it was a one-two punch of Nathanson and Greg Behrendt that brought me to a Sketchfest event six years ago where I met Gordon, my first editor-in-chief, who would bring me on not long after.) Anyway, Varney made mention of Nathanson’s being the evening’s…musical director? Boss of music? “No, that’s Springsteen. Anyway, it feels fun!” When asked what he’d been up to lately, Nathanson initially said, “not a whole lot” before going on to divulge that he’s been “starting to trim my body hair” and that he “overdid it” and now was “just kinda dealing with the fall-out.” On that note, it was time for Varney to introduce her special guests for the day. Nathanson played Journey’s “Don’t Stop Believin'” as she introduced the pair. The three immediately settled down to a table and chairs on the center of the stage, with Nathanson and his guitar at a nearby mic stand. The conversation was very casual, as it would remain for most of the afternoon. The topics of conversation for the day ranged from hometowns, high schools, and extracurricular activities, to instruments they had played (violin, cello, and guitar, but you have to download the podcast to find out who’s who). I don’t want to write my typical play-by-play style that I often do with concerts, because this is a podcast you can download and hear for yourself, so I’ll just give you a few quick highlights. The lovely, witty Jon Hamm. Categories for the game included: a sort of mentor (living or dead), movies you’d like to jump into, battles you’d like to reenact, celebrity roommates, food you could OD on without it harming you, and a crush or “alternate universe companion”. While Varney tallied their results, Nathanson offered a song. There was some joking about Lisa Loeb’s “Stay,” about which Varney said that “I don’t listen hard” was “as bad of a lyric as ‘rolling like thunder under the covers! 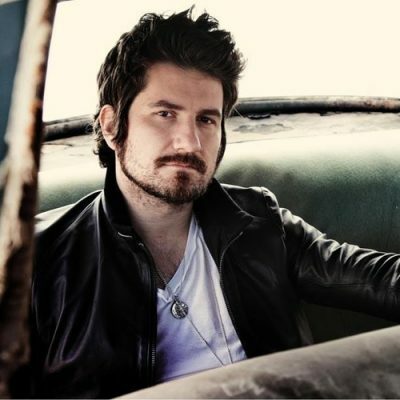 '” Hamm joked, “I guess that’s why they call it the blues!” Nathanson’s song, he said, was “about farting,” and about “how beautiful it feels” but thankfully, he wasn’t serious. He played his own song “Giants,” after which Varney was ready to delight us with her results, which I won’t spoil for you. The end. (It went by so quickly! Boo.) There was another show in the same theater immediately following, so there wasn’t much time for fanfare to close the show. All in all, though, it was a pretty great time, particularly because it was such a fun, funny group of witty people who didn’t take themselves too seriously. I would definitely go to another JV Club next time!